The Bear that Enjoyed Reading | What am I doing here? In olden times bears were worshiped by humans. They were often used as symbols of the Christian church because they were clever, powerful, wonderful climbers and fast runners. Because of their many attributes there was once a man who set about trying to teach a mountain bear to read. He spoke to the bear at length about the advantages of reading and how the bear could earn a better living if he could learn from books. The bear sat quietly and listened to the man. The bear could tell the man was very convinced of his argument and the bear felt sure that if he just sat quietly and pretended that he understood whatever the man was talking about then he would get some kind of reward. To thank the bear for listening, the man gave the bear a small pile of raisins. After some time the man gave the bear a book but the bear didn’t know what to do with it. So the man put a raisin between every page, and the bear liked the sweet raisins so much he turned every page and found another raisin. 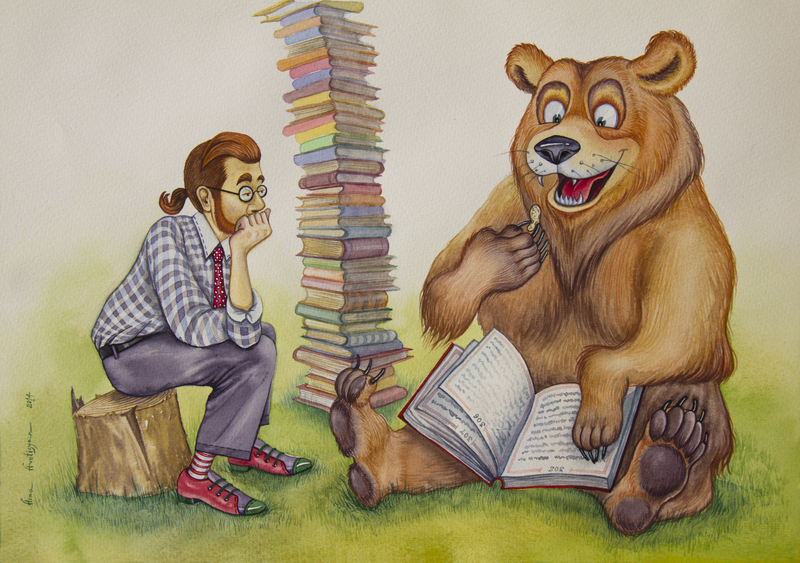 The man was very pleased because the bear was now holding the book, looking at every page and then turning to the next page. The man was sure that this was just the encouragement that the bear needed to begin to learn to read. When the bear got to the last page and the last raisin and was sure there were no more raisins he threw away the book disappointed and lumbered back into the forest to look for more food. In International Development we often find ourselves embarking on something that someone, somewhere seems to think is a good idea and will benefit people’s lives. Mostly we focus on the external drivers and the manifestation of concrete, visible change as the indicator of success. We assume that seeing external change means that there is some kind of corresponding “internal” change, a change in the way people who are poor see things and make sense of their world as demonstrated by their actions. But the priority of getting external change often leads to us only focusing on doing those things that will make it seem that change is taking place. And as is the case for the man in the story, we can be blind to what is really going on. In order to see external change the man effectively bribes the bear to take the action he desires, as though the external action will lead to internal change. But in fact, it is almost always the reverse. But if, like the man, you are looking for fast results and what you do if offer the equivalent of raisins, it will be inconsequential and not contribute to the desired change. The only way the bear is ever going to read is if he has the capability to read; even if he can he needs the motivation to determine that learning to read seems like a genuinely better option than his other alternatives. Clearly, in the story, neither is the case. In International Development, as often as not when the project finishes and the funding runs out, a community reverts back to what it knows, just as the bear did, because only the external manifestations of change, driven by one form or raisins or another, were present. This entry was posted in Stories From the Road and tagged coersion, community dependency, international development, stories about International Development and Relief, welfare mentality. Bookmark the permalink. about my presentation focus, which i am going to deliver in university.